Cornlands Chiffchaff was one of our yellow labradors. In character and outward appearance he was very similar to German Champion Cornlands Rupertbear. Chiffchaff was first exhibited in England where he was awarded a VHC at the Cotswold & Wyevern Labrador Retriever Club Championship Show. 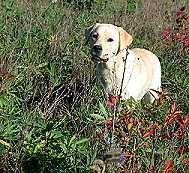 He was a working and show dog, a dual purpose labrador. Chiffchaff was both gentle and adventurous. 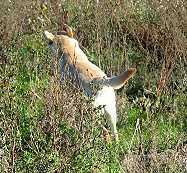 As a gundog he had an outstanding game-finding ability. 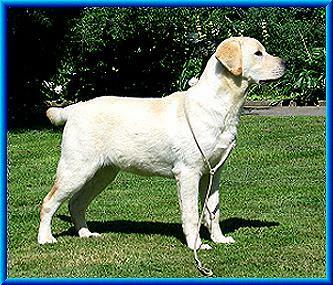 As a show dog he had been exhibited successfully in Germany and abroad. Cornlands Chiffchaff was first exhibited on the Continent at the EURODOGSHOW in Kortrijk, Belgium, on November 16, 2003. He won the Youth Class and was Best Dog (B.O.S). We are very proud of the boy. 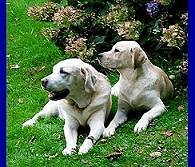 On January 31 2004 Ranger Tom aus Luehlsbusch and Cornlands Chiffchaff were exhibited at the International Dogshow in Eindhoven/ Netherlands where both boys won their classes. Chiffchaff was best Junior Dog. won the Open Class and was awarded a CACIB (Res.) and a CAC (Res.). 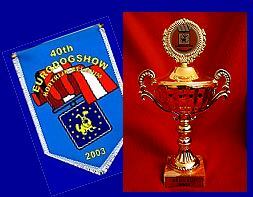 This successful team was also exhibited at the International Dog Show in Saarbruecken (Germany) on May 31, 2004. Ranger Tom gained an ‘Excellent’. Cornlands Chiffchaff won his class. 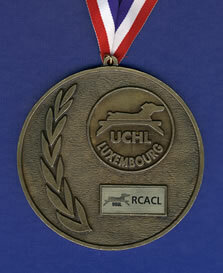 Further Chiffchaff was awarded the title of Saarland Junior Winner 2004. Cornlands Chiffchaff spent his summer holidays in England and Wales. 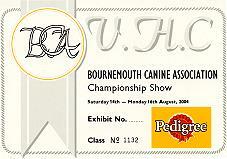 At the Bournemouth Championship Show he won a VHC. 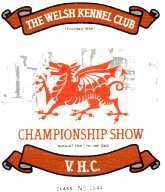 The Welsh Kennel Club ran its Championship Show in Builth Wells. 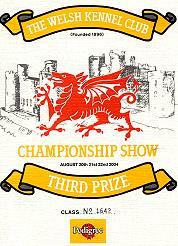 Chiffchaff won the third prize in his class on the Royal Welsh Showground. 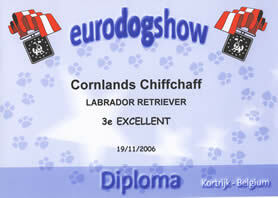 Cornlands Chiffchaff was awarded a CAC (Res) at the Rostock International Dogshow 2004. At the Bundessieger Show in Dortmund he was fourth. 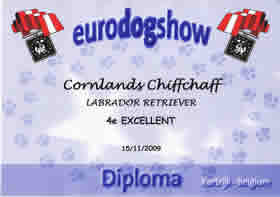 One day before his second birthday Cornlands Chiffchaff was exhibited at the prestigious Brussels Dog Show 2004, Royal St. Hubert. 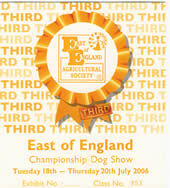 He was awarded an Excellent in the open class which had a double-digit entry. In September 2005 Cornlands Chiffchaff was twice exhibited abroad. In the capital of the Grand Duchy of Luxembourg he was placed Fourth and was awarded an Excellent. 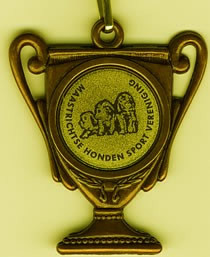 In the Kingdom of the Netherlands Chiffchaff was the winner of the Open Class at the International Dog Show Maastricht. On September 2, 2006 Cornlands Chiffchaff was awarded a CAC (Res.) at the International Dog Show of the Grand Duchy of Luxembourg. Third Prize at the Internationale Rashondententoonstelling Maastricht, The Netherlands, in September 2006 (Excellent 3). 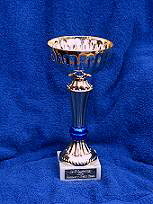 Third Prize at the Centenary Show of the German KC (VDH) in Dortmund on October 14th, 2006 (Excellent 3).